PLOT: Three decades after the defeat of the Galactic Empire, a new threat arises. The First Order attempts to rule the galaxy and only a rag-tag group of heroes can stop them, along with the help of the Resistance. The MovieMuse team discuss the chequered history of Star Wars and their hopes for the future of the franchise in MovieMuseTV episode 2. 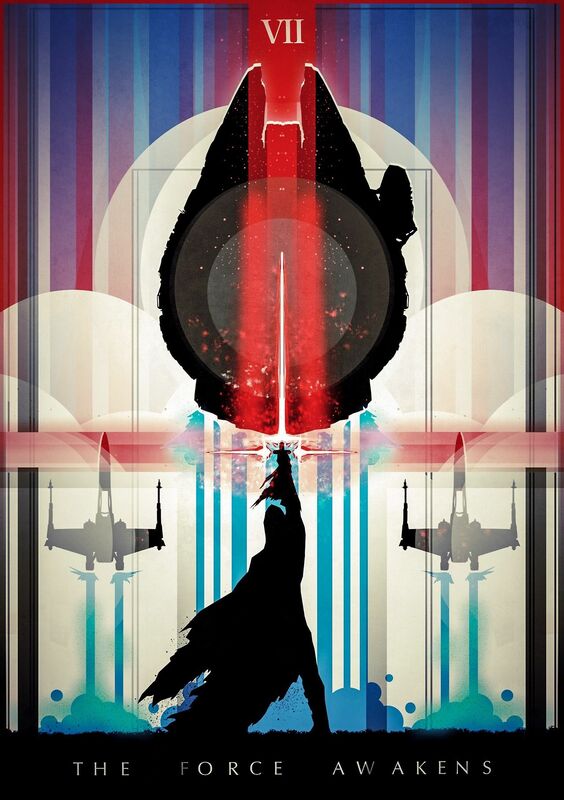 Star Wars Episode VII: The Force Awakens is finally here! The MovieMuse team give their thoughts on the new film in a relatively spoiler-free review. Proceed with caution! 2012 was a dark time for Star Wars. The prequel trilogy was long gone, and left a bitter taste in most fans mouths. The Blu-ray boxed set had been released, with countless unnecessary changes to the original trilogy making it near-unwatchable. George Lucas had openly admitted that he was not interested in making more movies in the saga. Then, a new hope arose – Lucasfilm was sold to Disney, who immediately announced their intention to make Episodes VII-IX. Longtime fans were sceptical – would a Disney-produced Star Wars trilogy be too sanitised and family-friendly? Would the films simply be a vehicle for endless merchandising? Would they understand what the fans really wanted from the franchise? Early signs were encouraging. The stars of the original trilogy all signed on for the new movie, with JJ Abrams as director, fresh from successfully rebooting the Star Trek universe. Disney released Star Wars Rebels and Droid Tales, proving that they understood what the fans did and didn’t like about the series to date. The teaser trailer for the new film revealed glimpses of interesting new characters, while the San Diego Comic Con preview showed a return to using more traditional filmmaking techniques, and a cast and crew that appreciated the weight on their shoulders to produce a film that fans would enjoy. Out of respect to anyone that hasn’t yet seen the film, this review will not divulge any plot details that aren’t already discernible from the trailers. 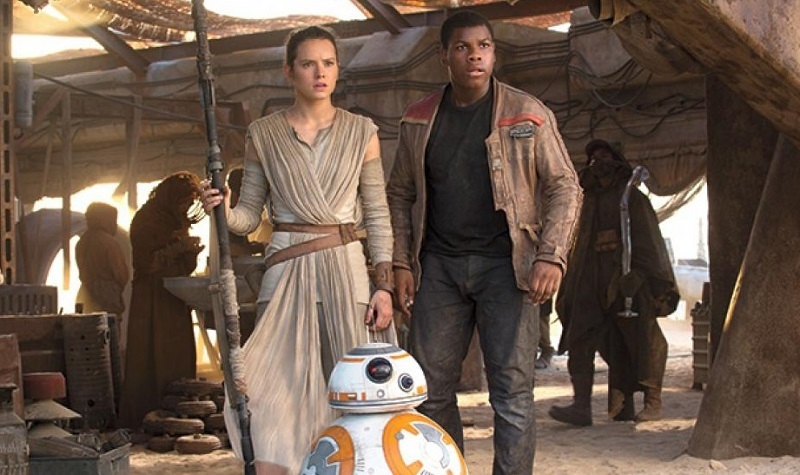 The story sees Rey, a young girl living on the poverty line on the harsh desert world of Jakku, cross paths with Finn, a disillusioned Stormtrooper that has fled service of the First Order. Together they embark on a journey that sees them encounter legendary figures from the Rebel Alliance, with whom they join forces to face the threat of dark Jedi Kylo Ren and the evil forces under his leadership. There’s nothing ground-breaking here – it is the classic story of good against evil that forms the basis of all Star Wars films, and is effectively a rehash of episodes IV and V. That alone should tell you that it’s very enjoyable, but allow me to elaborate further. Watching The Force Awakens is like buying new pair of trainers and finding that they’re immediately as comfortable as your old slippers. Familiarity and nostalgia are a huge part of what makes the film so much fun, with innumerable references to the original trilogy that will at least make you grin from ear to ear, and at their best make you weep tears of joy. It’s also funny – really funny. The interaction between new and old characters will often make you laugh out loud, with genuinely witty dialogue and comical sequences that were missing from the prequel trilogy making a welcome return. There were fears from some quarters that Daisy Ridley’s acting ability might be questionable, and during early scenes those fears looked to be well founded. But as her character grows in confidence as the film progresses, so does the actress, portraying Rey as a strong, independent and brave heroine whose shoulders the future of the saga will almost certainly rest upon. John Boyega is absolutely outstanding as Finn, bringing a mixture of nervous energy and infectious enthusiasm to the screen in every scene with a character that is instantly loveable. Oscar Isaac is less impressive as cocky Resistance pilot Poe Dameron, the third of our new heroes, but in his defence he has a lot less screen time than the other two, and much of it is spent in the cockpit of an X-Wing. 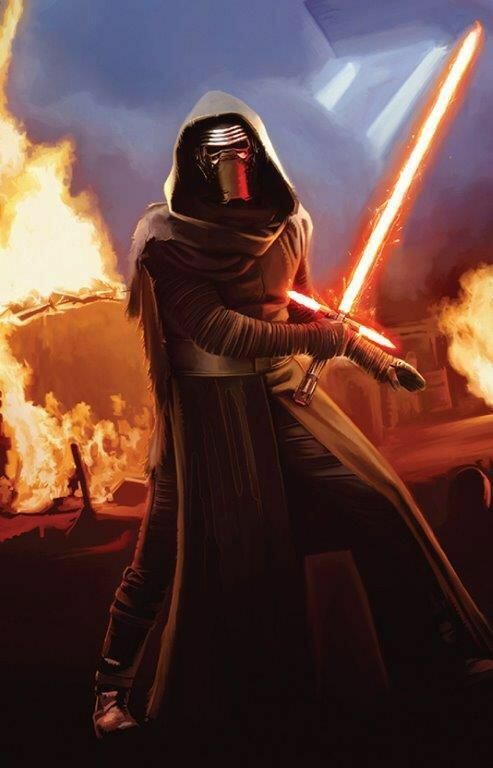 Of the other new faces, Adam Driver’s portrayal of Kylo Ren is the most interesting. He is not a straightforward villain by any means, instead being an emotionally fragile character that is desperate to follow in the footsteps of Darth Vader. Domhnall Gleeson effectively channels Peter Cushing as the ruthless General Hux, but the remaining bad guys are largely forgettable, with the characters played by Gwendoline Christie and Andy Serkis adding little to this story. One feels they will have a larger part to play in future instalments however. 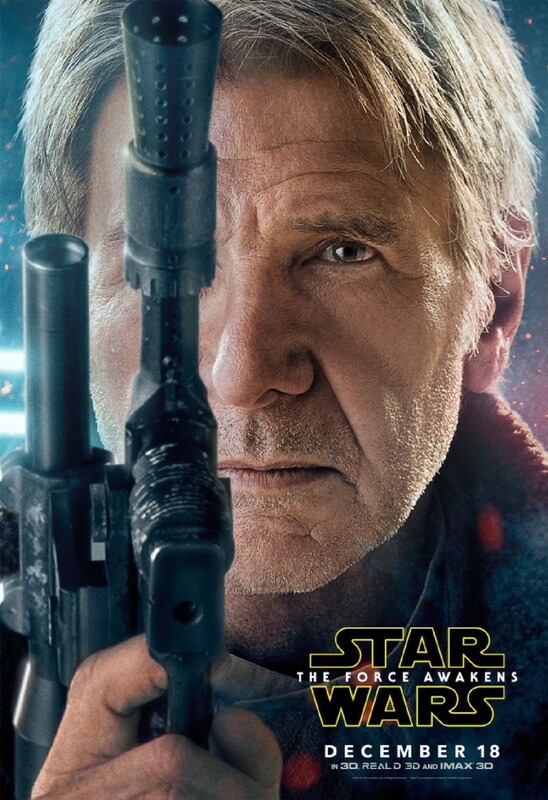 That just leaves the returning heroes from the original saga, and Harrison Ford is the standout as you would rightly expect. 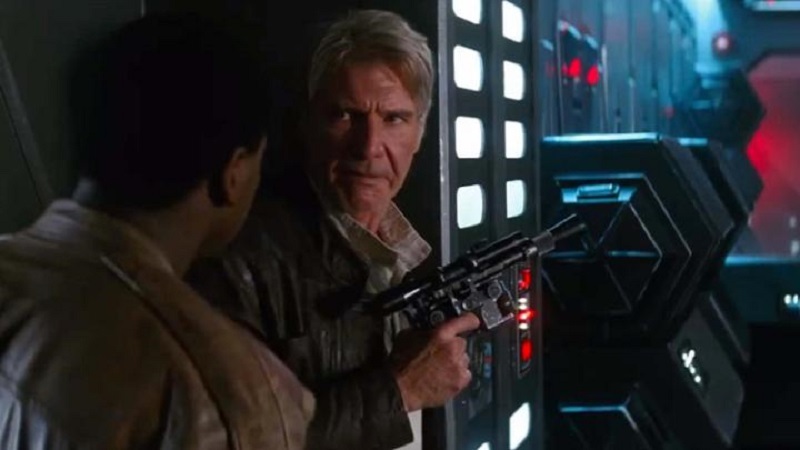 He may be thirty years older, but Han Solo hasn’t got a lot wiser and Ford steps back into the well-worn clothes of the roguish smuggler like he’s never been away. There are wise-cracks and reckless decisions galore, with some of the most emotional scenes in the film centred on the character. Chewbacca is also back for the ride and provides a number of great moments. Carrie Fisher and Mark Hamill are used a lot more sparingly, again as expected, but still effectively. The special effects and action sequences are naturally breath-taking and almost relentless. CGI effects are of course used for the battle sequences, but not to excess, and the much-lauded practical effects bring a level of realism that means the world created by JJ Abrams is just as lived-in and believable as the one created by George Lucas in 1977. In no place is this more evident than in the form of the utterly adorable BB-8. It would have been far easier to computer-generate this lovable droid, but the fact that the producers invested time and money to create such a unique and technologically ground-breaking character speaks volumes about their commitment to the film. Huge credit must be given to Abrams, who much like the characters in the film carried the hopes and expectations of an entire galaxy of movie fans, not to mention the pressure from his employers to kick-start a franchise whose future was on a knife edge. Along with co-writer Lawrence Kasdan, he has created a story that delivers plenty of fan service but still has enough freshness to keep more jaded followers of the saga like myself interested. Disney must also be congratulated for taking a back seat, something made evident by the lack of appearance of their famous castle prior to the equally famous opening titles of the movie. Concerns that the franchise might be made too family-friendly have also been cast aside by the BBFC classification of the film as 12A, only the second Star Wars film after Revenge of the Sith to be given such a rating. If any criticism can be levelled at The Force Awakens, it is that the familiarity that is one of its strongest points could also be perceived as one of its weakest. There’s no doubt that by tapping into so much nostalgia about the series, the producers have played it relatively safe. This is completely understandable, as the first priority was to get the fans back on-side after the disappointment of the prequels, but hopefully now we are with them Disney will take more risks with the second and third instalments of this trilogy. That Episode VIII will be written and directed by somebody different certainly encourages us that will be the case. From a personal perspective I was disappointed that R2-D2 and C-3PO, who I have always seen as custodians of the Star Wars story, were mostly relegated to bystanders in this instalment, although it was gratifying that ultimately R2 had a significant part to play. I also found John Williams’ score to be a bit underwhelming – there were new themes for characters such as Rey and Kylo Ren of course, but in keeping with the nostalgic focus, these played second fiddle to ample reuse of more recognisable music from the original trilogy. Watching this film brought about many emotions, but the overriding one was that of relief. Relief that the film came to be; relief that I got to see it without knowing what happens beforehand; and relief that it is actually good. I will reserve judgement on where it sits in the grand scheme of the Star Wars saga until after further viewings – for now it is comfortably in fourth place and vying for third with Return of the Jedi. What happens next remains to be seen, and the fact that I’m excited about what is to come is obviously a good thing. For now, let’s just bask in the warm, fuzzy feelings that this film has created and be happy with the knowledge that Star Wars is back! Main review by Mat Corne. “Wow, what a ride that was! Not exactly breaking new ground story-wise, but the film hit virtually every branch of the fandom tree as it fell to earth. 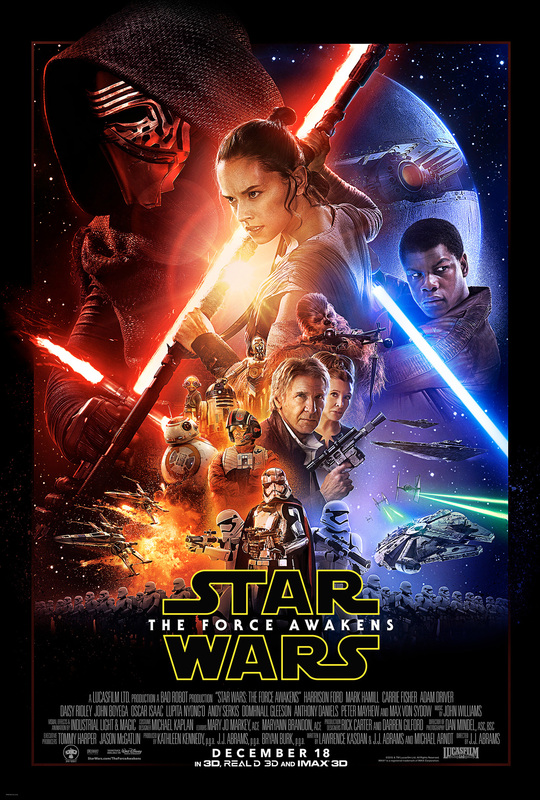 With the humour level set perfectly, great performances from most of the new actors, wonderful reunions with old heroes and action sequences that knew when the CGI should be toned down, Star Wars: The Force Awakens has reinvigorated the franchise and, if it is possible, made me a bigger fan. “Given it was never going to live up to the extraordinary hype, I was moderately pleased with the Force Awakens, despite one or two reservations. The special effects have more ‘weight’ to them and generally the performances are all fine, a particular relief after the horror of witnessing Hayden Christensen’s ‘acting’ in episodes II and III. Where I felt a little let down was the familiarity of its scenario. I rolled my eyes when the First Order revealed another planet-destroying weapon with another obvious weakpoint. But hey, let’s leave it virtually unguarded too, eh chaps? “It was with excitement and trepidation in equal measures that I went to watch it, and I do like the film, I genuinely do. I like the whole feel of the film, the score may not be one of John Williams’ best but it creates a feel, The Star Wars feel, which gave me a warm and fuzzy feeling inside like connecting again with an old friend. The action is good, great space battles, good fight scenes, the effects are just fine, I even liked the comedy, to a point. The interaction between the old characters is good and the new characters are well rounded and provide a believable story. But there is something missing. Mat - "Huge credit must be given to Abrams..."
Gordon - “Wow, what a ride that was!" Graeme - "...a rollicking and entertaining two hours"
Simon - "The film should be called Star Wars A Renewed Hope"
An unbelievable return to form for the Star Wars franchise, with an exhilarating, nostalgia-fuelled story that introduces a new generation of heroes and villains that should comfortably live up to the standards set by their predecessors. The Force is back!